2012 Couly-Dutheil Chinon Rosé Domaine René Couly: Retail $20. We had bought a couple of cases of this last year and we have been ecstatic with that purchase. This rosé is one of my wife’s favorites, so it seemed like a great idea to open it as I cooked–why is it that meals that are made while sipping on some wine always taste better than those that were prepared sober? Outstanding. 90-92 Points. NV Veuve Clicquot Ponsardin Champagne Brut Rosé: Retail $60. I know a lot of people pan the good old Veuve since she seems to be overly popular and “chic”. Well, there might be a good reason for that–the wine is outstanding. Great nose, deep flavors, and a solid finish. The standard yellow label Veuve has always been a bit on the fuller bodied style, and this one, with the additional Pinot Noir, goes even further in that direction–which is a good thing as far as I am concerned. Outstanding. 90-92 Points. 1999 Mailly Grand Cru Champagne Brut Millésimé: Retail $60? I brought this back from the winery in ’07 and had been holding it, waiting for the right moment. If there is a more “right” moment than my wife’s birthday, I am not sure what it is. Even though this is pushing 15 years old, it is still fresh and vibrant with near perfect balance. One bottle left that I will hold a bit longer in hopes that the “older champagne characteristics” might emerge. Outstanding. 92-94 Points. 2005 Domaine Jessiaume Pere et Fils Santenay 1er Cru Gravières: Retail $40. I bought this back in ’11 from Wine Library for the more than reasonable price of $20. I have since been sitting on them since there are few greater joys than an aged Burg. I finally broke down and popped this to see where it was and where it might be heading. Fantastic. Very little age showing in the color, great Burgundy nose of tart cherry and a bit of leather. Seamless on the palate with a lingering finish. Outstanding. 91-93 Points. 2008 B Kosuge Pinot Noir The Shop: Retail $50. Wow. I have aways respected Byron, but this goes beyond the pail: Rich fruit and deep flavors in perfect balance. I opened this for my wife on her birthday and this did not disappoint. Far from it! Outstanding. 91-93 Points. 2013 Gustafson Family Vineyards Sauvignon Blanc Estate Heritage Tree Vineyard: Retail $22. Great tropical notes and not nearly as tooth enamel endangering acidic as most domestic Sauvignon Blancs. Great mouthfeel and balance on the palate with a suppleness that is usually reserved for Chardonnay. That varietal acidity comes through in spades on the finish, though, rendering this one of my wife’s all-time favorite Sauvignon Blancs. Very Good. 87-89 Points. 2012 Mauritson Wines Sauvignon Blanc Dry Creek Valley: Retail $21. I have never visited Mauritson, but I have driven by it countless times now and after tasting this, I will need to pull in the next time. Some great Sauvignon Blanc notes on the nose: lemon peel, cut grass, even a bit of pineapple. On the palate, it remains a very nice example of the variety, although I would like to see a bit more acidity. Very Good. 86-88 Points. 2007 Mill Creek Vineyards Syrah Estate Corner Pocket Vineyard: Retail $32. Spicy nose of white pepper, sage, and a bit of vanilla. On the palate, a wave of fruit followed by a spicy mid palate and a lasting finish. I do not have a ton of experience with Dry Creek Syrah, but this 7-year-old wine bodes well for the variety in the appellation. Very Good. 87-89 Points. 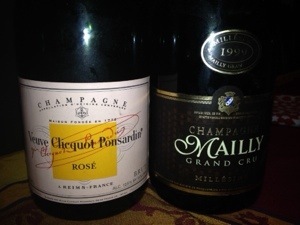 WINE OF THE WEEK(s): Looking over the wines that we consumed this past week, it was clear which wine was the WOTW: the 1999 Mailly Grand Cru Champagne Brut Millésimé. It was a fantastic wine, which I feel will only get better (good thing I have another!). Another wine on the list that I feel will continue to improve is the 2005 Domaine Jessiaume Pere et Fils Santenay 1er Cru Gravières (good thing I have another five!). All told, it was a pretty good few days in the Drunken Household, but I made a grave error before departing for Europe: I neglected to pull out some wine for my wife’s consumption while I am away. This means, I am afraid, that she has the free range of the cellar until I return. That’s OK, she’s worth it. 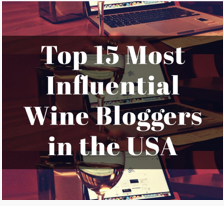 This entry was posted in Cabernet Franc, Champagne, Pinot Noir, Sauvignon Blanc, Sparkling Wine, Syrah, Wine and tagged Burgundy, Champagne, Chinon, Loire Valley, Russian River Pinot, Veuve Clicquot. Bookmark the permalink. You know, it is going to be a shade or twelve over your budget! So, let me get this straight–you are looking for the wine so I can buy it to share with you? Oh, I see how you work…. The widow’s Rose. Always enjoy it. Man, I am addicted to your Ohmygod series. I asked a question somewhere around 20 or so . . . did you see it? Thanks for such a great blog! Sorry, been out on the road. Will try and get to it today! bBeing a drunken cyclist, that is against the law. haha. Thank you! Only if you get caught, right?